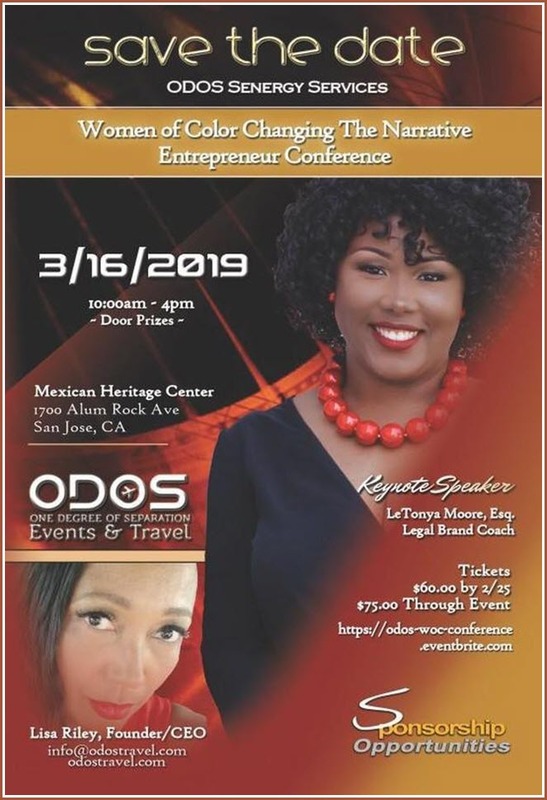 SAN FRANCISCO BAY AREA, CA: One Degree of Separation Events and Travel (ODOS) founder, Lisa Riley announced today that her company will share a host of Economic Development Resources during its ‘Women of Color Entreprenuer Conference’ under the name of its non-profit arm ODOS Synergy Services. The conference will take place at the Mexican Heritage Plaza in San Jose, California on Saturday, March 16th, from 10:00 am to 4:00 pm. Unique in its structure and substance, the event targets African American, Latina, and Asian.women in Silicon Valley and Bay Area. Legal Branding Coach, LeTonya Moore, Esq. will keynote the affair. Milan Balinton, CEO of African America Community Services Agency, has been tapped as Master of Ceremonies, and Tressa Williams, CEO, State Farm Insurance will moderate lively and informative panel discussions. Speakers and panelists will reveal their respective expertise on such topics as Legal Protection & Branding, Healthy Lifestyles, Economic Development & Financing, Entrepreneur’s Best Practices, and Social Media Marketing. Among the conference participants are Bay Area notables Mayor Richard Tran (Milpitas, CA), Vice Mayor Magdalena Carrasco (San Jose Dist. 5), Jeff Moore (President, San Jose/Silicon Valley NAACP), Tara Lynn Gray, (CEO, Fresno Metro Black Chamber of Commerce), along with expert panelists that include Melody Haynes (Mental Health), Wanda Whitaker (Holistic Therapist), Denisha Blake (Healthy Eating Coach), William Wheat (Non-profit Grant Writer), Tracey Lee Davis (Online and Social Media Branding), and several additional dignitaries and skilled Bay Area professionals. Riley commented, The digital age is upon us and it is critical that under-represented female entrepreneurs be prepared for a new economy and online market. One Degree of Separation Travel and Events (ODOS) saw a niche and recognized a need in the African American Community, to create one-stop shopping venue, making it easier to obtain resources and information on the travel experience some African Americans only dream of or deem impossible. The Company links diverse travel agents, travel consultants, and exciting travel destinations. ODOS Synergy Services is a 501(c)(3) non-profit entity.